Le Sucré Lab has some competition! By now you’ve likely come across the viral sensation that is Le Sucré Lab’s Chocolate Dream Cake. The showstopping confection, which is packaged in a tin can and dusted with cocoa powder, is rustic-chic in appearance, making it the perfect Instagram fodder. And beyond its 'grammability, what has been turning heads about the dessert is the taste. It’s hard to overstate just how much people love it. But is it the only chocolate cake worth ordering? We did some investigating for you, and found 10 worthy cakes-in-a-can that’ll satisfy your chocolate craving, without the long queue! With tens of thousands of followers on Instagram, a homebase right in Metro Manila, and a few celebrity fans as well—these OMG Chocolate cakes are gathering a mob of their own. Order now before they get booked up too! This cake boasts five layers: moist cake, ganache, frosting, melted chocolate, and cocoa. Plus, each tin costs only P350! Mrs. Brown’s tin can cake dates back to 2017. This dark chocolate with fudgy frosting is a quaint take on a tried and true classic. The only catch is that the seller is in Calamba, Laguna. So, if you’re in that area, this is your chance to jump in on the tin can trend. Dream Bakers has its own twist on the tin can cake, flavoring it with authentic Italian wines. The Red Wine Cake is a luxurious confection smothered in rich chocolate. It’s chic enough to be a giveaway at your next dinner party, but low-key enough to dig into while watching Netflix on your couch. Sherryl has been making ooey gooey chocolate cakes in tin cans for well over a year. During Valentine’s season, she switches the copper tin for a festive heart-shaped one, boosting the cake’s Instagram factor further. And if you’re in the market for muffins, brownies, and other everyday baked goods—she’s got those, too! One of Cebu’s best cake-makers is in the tin can game too. Although Kay Dy is really known for her elaborately tiered cakes, cupcakes, and doughnut towers—she accepts orders for the rustic cakes, too. Hers come in soup cans, with an assortment of four cake flavors per order. In Pampanga, Love at First Bite makes their own version of decadent chocolate cakes for only P125. At only four inches in diameter, it’s more of a palm-sized treat. Still, it’s got five layers of gooey goodness—so we’re not really complaining! Cakes by Alyanna is Antipolo’s answer to Le Sucré Lab’s masterpiece. It’s about the same price as its viral counterpart, and is just as mouthwatering. It’s got six layers of goodness packed into its quart-sized tin! Plus, this cake only take three days to order! As its name suggests, Tincakes by Elaine is committed to the rustic dessert. 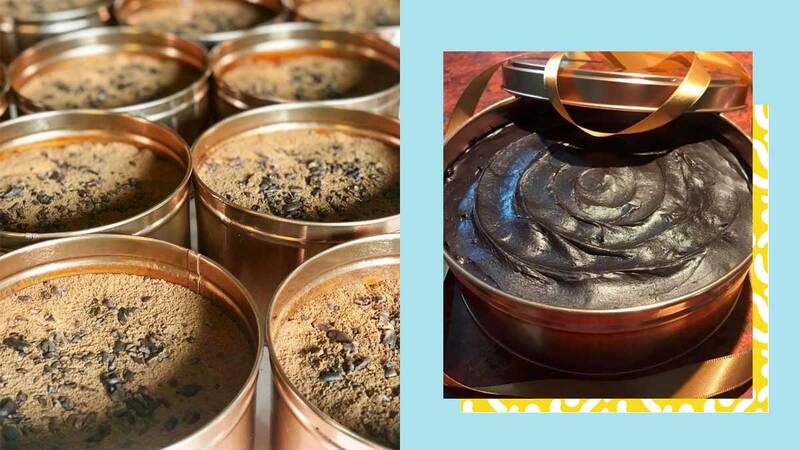 While they offer a variety of pastries, it’s their Chocolate Tincake that really shines! It’s got chocolate truffles and Ferrero Rocher icing! Who can say no to strawberries and chocolate? It makes total sense that Bakepertise topped their take on the trendy dessert with the juicy berries.